Paddle boarding is quickly becoming a favorite pastime of many people. It is great exercise and enjoyable to do. The iRocker 10ft inflatable paddle board promises to be everything that a person could want in an inflatable paddle board. From the looks of it, they may be that and more. The iRocker board is 10ft long by 30inches wide, and six inches thick. It can support up to 350 pounds each when fully inflated to 15psi. It is made using military grade materials that are drop stitched, which means if you hit rocks or other stuff with your board, you do not have to worry about possible punctures. However, it is lightweight at only 28 pounds. The top layer of triple layer inflatable paddle board is made of EVA diamond groove deck traction padding. This means you will not slip around on the board while you are attempting to paddle, even if you do shift position quite a bit to reach each side. With your purchase, you will receive an ultra-efficient 24” selectable high pressure, dual action hand pump. The pump has an integrated pressure gauge to ensure you fill it to the recommended PSI. Other accessories include an aluminum paddle, and a backpack that is fully adjustable. If you carry everything in the backpack, you will have to be able to carry 38.1 pounds. This is lighter than other iSUPs. The iRocker is covered by a full two-year warranty that covers workmanship and materials. This means that if your purchase does not meet your expectations, you are covered. 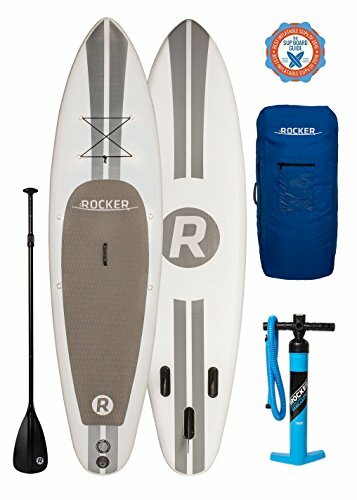 Every iRocker paddle board owner seems to agree that it is a very stable paddle board, even for beginners. They say that even in windy conditions, they never feel as though they may fall off. As far as beginners go, they say that they felt stable even when they first climbed on to the paddle board and attempted to stand up. They like that even though they are on an inflatable board, they stay dry and do not sink into the water very far. This is due to the six inch rails and the fact it does not bend at all where you are standing. The fins on the bottom of the board also ensures that it paddles straight and stays on the right course. Most people say that inflating the paddle board is extremely easy. Some of them say that it inflates in only a couple minutes. Others say it takes them approximately 200 pumps with the hand pump to fully inflate. Either way, you do not have to work hard or long to get on the water and off on an adventure. The only real issues that anyone has with the iRocker is the paddle. It is made of aluminum, but has a joint in the center of it. Some fear that the joint will become less solid as time goes on. They also do not like that it has a hard plastic handle. With that idea in mind, it is still great for a beginner, and because of the low price, upgrading your paddle should not be that hard to manage. One person did have issues with the fin not staying attached properly. According to him, when he lost the fin, he was unable to control the paddle board. Immediately, upon complaint, customer service made contact to fix the issue.